Once in our lifetime, we have come across a scene in a movie where a person sits at this comfortable, airy place looking far away in the distance, enjoying the view and taking in the aroma from the delicious looking platter of food and a glass of crisp wine, on the table in front of them. It seems so calm and romantic and we all want to have an experience similar to that once in our lifetime too, don’t we? The only places, providing a beautiful view of the city and far away, with snacks along with drinks, is a rooftop. You can feel the peace by watching the blue skyline during the day or get mesmerized by the starry sky at night. You can share this with special people and you can celebrate this time with mouthwatering dishes and various drinks. You can breathe in the fresh air and feel the beauty all around. What more can one asks for? If you are looking for something like that, no need to surf Google and ask for random people’s suggestions. 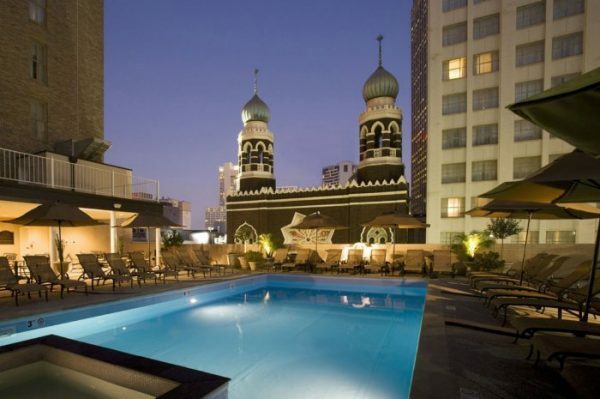 Here we have shortlisted some of the best rooftop bars and restaurants around the globe. Each owns a unique feature and you can choose your favorite according to it. Just book a ticket for an evening at one of these rooftop bars to have one of those rare, unforgettable moments. It will be worth all your money! Set at the coastal region of the old town of Corfu in Greece, this exquisite rooftop restaurant provides an exotic view of the seaside and the small port, where luxury boats and ships float in an array. 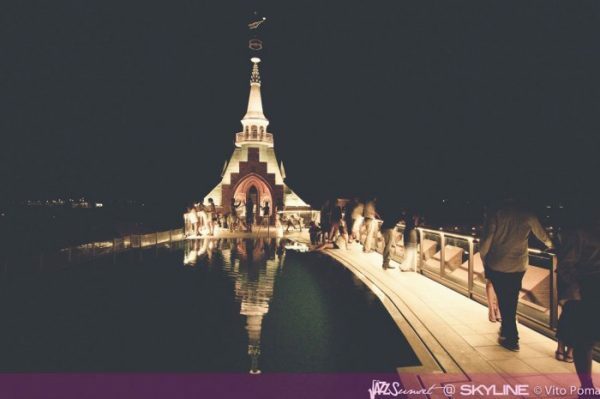 It is actually on top of the Cavalieri Hotel which was originally built in the seventeenth century. Unfortunately, the rooftop restaurant is only open during specific months (May to October) in the year. 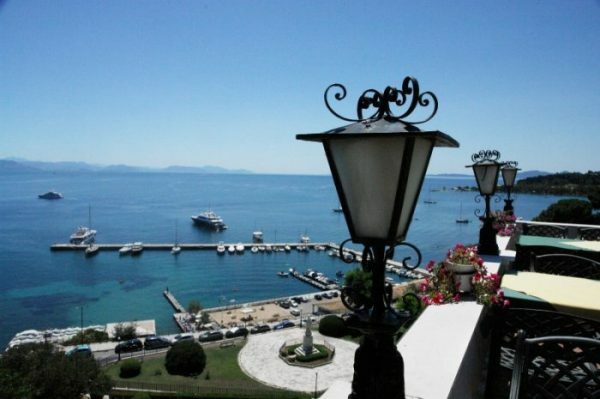 You can warm yourself in the sun while enjoying tradition Greek dishes and cocktails. Want to know how the New York City looks from the top? 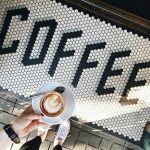 Is birreria the place to be? 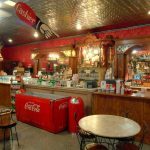 Moreover, you can order the food of your choice from the extensive menu that offers anything from sausages made at home to various cheese, mushrooms and salumi. As for the drinks, they have cask beers that are specifically brewed there. 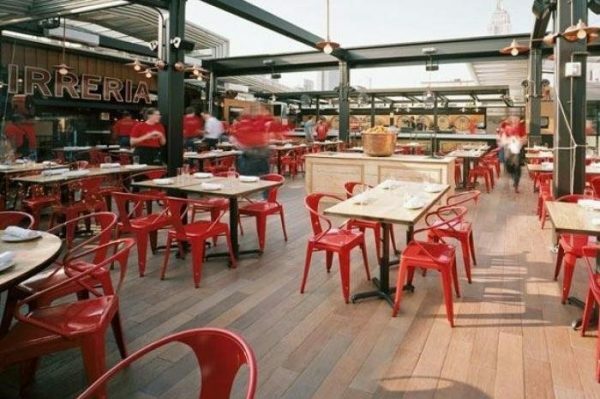 Birreria, the idea put into action by the team of Batali/ Bastianich, gives you a clear view of the Madison Square Park. 3. Georgeâ€™s Ocean Terrace, La Jolla, Calif.
What’s the best place where you can enjoy good food and stunning view, simultaneously? You guess it right. A restaurant at the coast, overlooking the town and the blue ocean beyond. One of such restaurants is at the top of George’s at the Cove in California. The rooftop bar has an extensive menu, serving a fabulous drink to wash down the mouthwatering dishes as you look at the sun setting in the horizon. This is the place for all youngsters to hang out with their friends. As you can figure out from the name, the 107th level of the Stratosphere Hotel, which is also its rooftop, is open from 4 am to 4pm daily, so that those who want to relax can dine here for some food and drinks. And not to forget, viewing the brightly lit city of Las Vegas. The roof, however, is not open, enclosed with glass windows from ceiling to the sides, giving you a feeling like you are on top of the world. Roosevelt, the luxury hotel, famous for its grandeur, has opened an equally lavish bar and pool on its rooftop. You can have a spectacular view of the surroundings, which include the historic French Quarter. The pool is only in the use of hotel guests and that too during summers. As you enjoy a swim in the cold water, there are beverages and refreshments served to you to make you feel extraordinary. 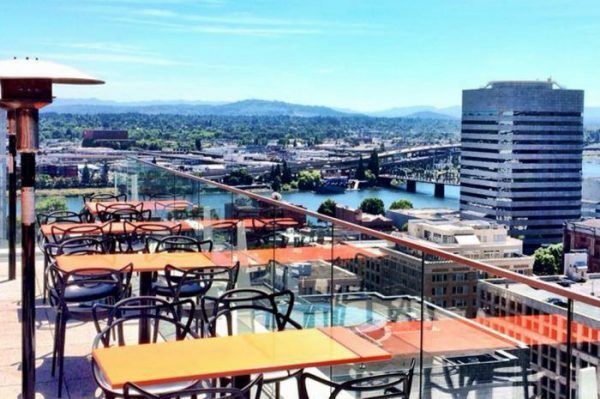 Portland- the city that has numerous bars and people who would usually turn up at a bar than at a restaurant- has Departure, a rooftop restaurant at the top floor of The Nines Luxury hotel, which attracts the most attention from the residents of the city. The amazing thing with this restaurant is that it has a glass from floor to ceilings, giving a view of all of Portland. The food served here is also different from the mainstream as they serve Asian cuisine. 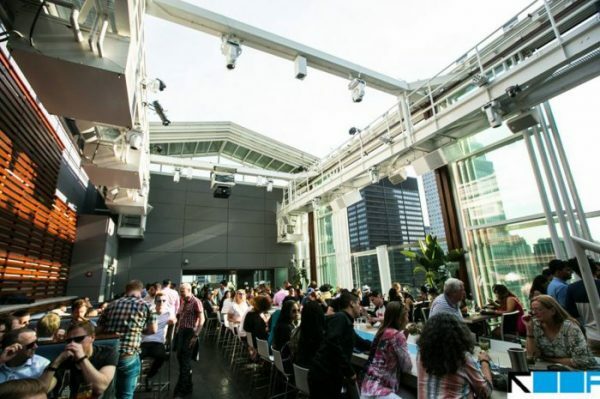 Situated on the top of The London, the Rooftop is a peaceful place to dine at. You can have amazing views of Los Angeles, Beverly Hills and Hollywood. From 6;30 to 8:30, every weekday, the restaurant has a ‘The London Hour’ where you can enjoy the cocktails and few other snacks, like crab toast and rock shrimp tempura, at a low price than the original. The place is nearly crowded all the time, whether it is day or night, yet, it is comfortable. The environment is casual. It is not a fine restaurant where you need to be at the best of your manners nor a noisy bar that will give you a headache. 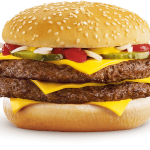 Just sit back, look over Chicago and devour something great from the variety of dishes that it has to offer. No place can be more charismatic than this one. 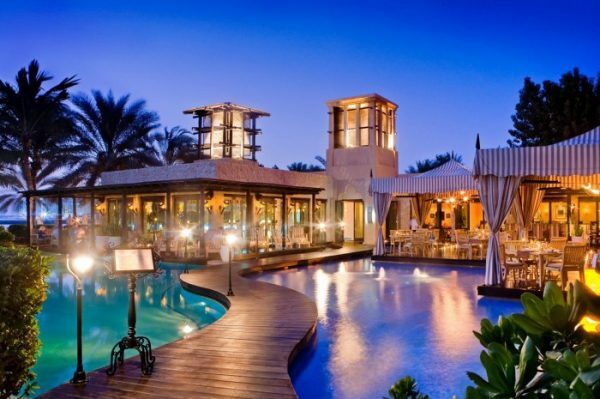 Atop the One and Only Royal Mirage’s Arabian Court in Dubai, is the rooftop lounge providing luxury in every sense. The interior is amazing and ultra comfortable with couches and fluffy cushions, candle lights and traditional architecture that includes small pools imitating oasis in a desert. The Middle Eastern feel to it is extreme and if you have a chance to visit Dubai, make sure you dine out here. This is a yet another different version of rooftop bars, one that has not been seen anywhere else. On the highest level of The Hotel Gansevoortâ€™s in the Meatpacking District of New York, is the Plunge Bar and Lounge. You can view all of New York from here as if the building were in the centre of it. The Hudson River can be seen clearly. 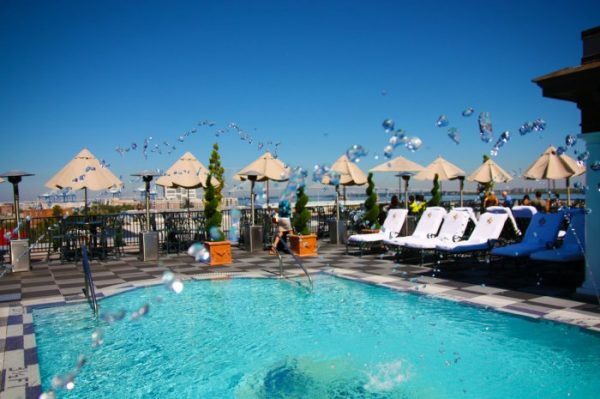 The rooftop bar is basically an enclosed space, except for the balconies and a pool. Also present is a grill and a cabana. Inside you have comfortable seating, a flat TV screen and even a DJ booth. With so much to offer, you can’t simply miss the opportunity of not spending a few hours here. It stands in the St. Louis, on the highest ground of Hilton. It has multiple indoor and outdoor bars where you can sit, eat the delicious food prepared by the famous chef, Matt Wessel and enjoy yourself in the most comfortable manner. What’s more, you can have a beautiful view of the whole city from any angle you want, which is what gives this bar the name ‘Three Sixty’ (360 angles, you see). 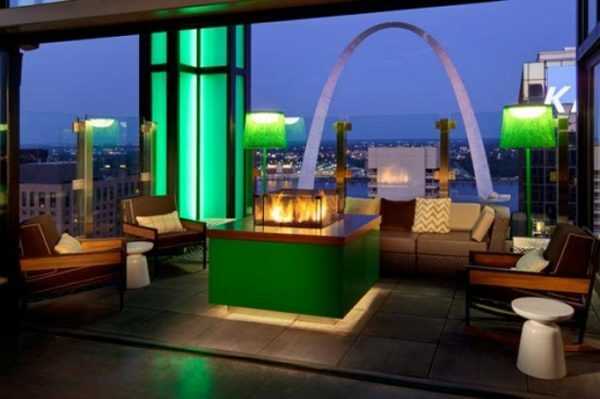 The direct view of the Gateway Arch, the Mississippi River and Busch Stadium makes the trip to this bar all the worthwhile. One look at it is enough to make you sigh- it’s that rare a view. On the top of the luxury apartment and hotel, The Donald, this place is for those who have an overflowing bank account. Next to the pools, the decks are lined, for you to lie down and enjoy every sort of drink, be it wine, beer or cocktail, and in any way you want. If you are hungry, feel free to order a snack like a lobster roll, to feel like you are at the seaside. 13. Pavilion Bar, Charleston, S.C.
A mini pool, with a small deck from where you can see both, the city and the seaside, is what distinguishes Pavilion Bar from the other rooftop bars. It is located on the top of Charleston and is the perfect place to get a sunbath. Dishes based on seafood and every kind of meat, with herbs and spices, are offered here along with several drinks. 14. Top of Newport Bar, Hotel Viking, Newport, R.I. If you ever visit Newport, just don’t miss out on this. 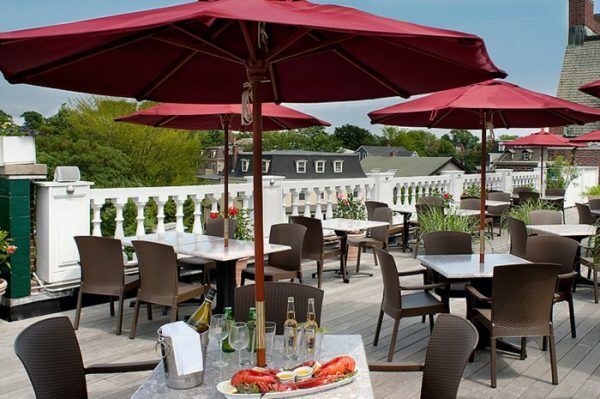 On the roof of The Hotel Viking (yes, the old hotel built in 1926), is a bar, which can show you all of Newport’s beauty. Added to this, the bar offers drinks like the Widows Walk and Bermuda Rum Swizzle, at reasonable prices. The salads and sandwiches will not disappoint you either. This one will simply take your breath away. The view is stunning- of the bar and the city too. On top of one of the tallest buildings in Venice, is an old mill by the name of Hilton Molino Stucky that has been renovated. Besides it is a large swimming pool. It is open from May to September during the year and has dishes like sushi on the menu. Probably, the best place to propose the love of your life. 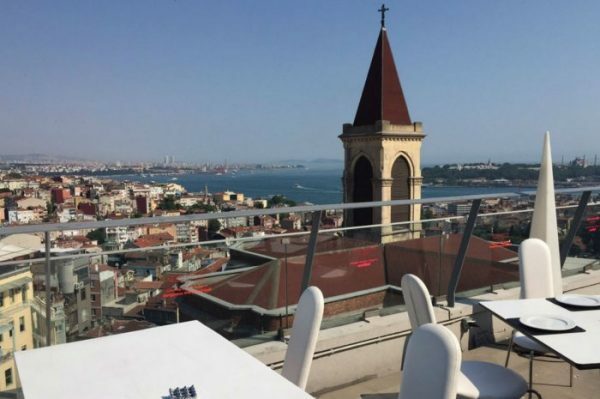 Istanbul, the beautiful city, has another asset in the form of this rooftop bar. Yes, the city has countless other similar bars, but what makes this one so special? It is a fine place to dine at, overlooking the Beyoglu’s old embassy row, the Bosporus strait and to the Marmara Sea. 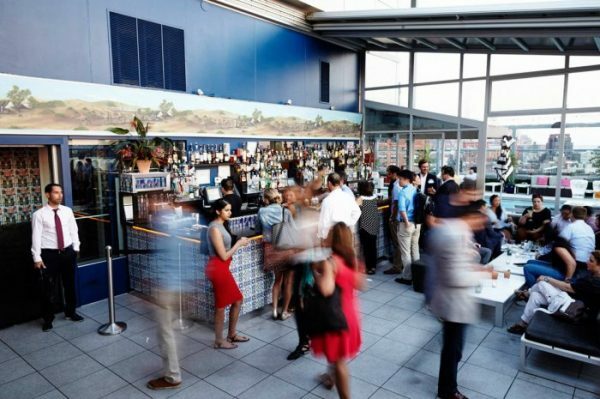 At night, the bar turns into a super cool club, on the spacious terrace. A trip here will be forever fixed in your mind it is simply that amazing. 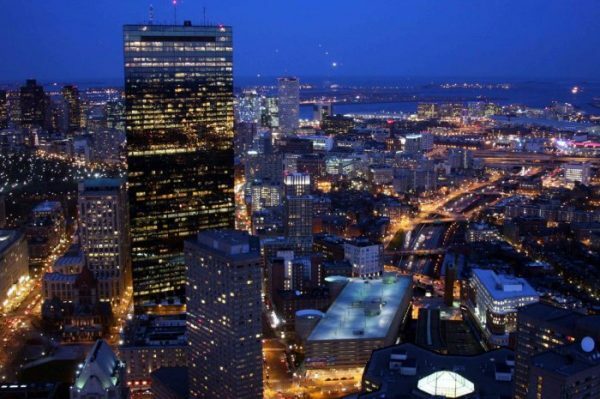 On the top of the sight-seeing deck of the Prudential Building in Boston’s Back Bay, is Top of the Hub. This bar is THE place, offering a view that no other building can, of the whole city and the Charles River. The food is delicious and you can stop there for a quite brunch on a Sunday, or else you can go at night when the music is loud and a huge party is going on. Looking for the most romantic place to pop the question to your better half? Search no more, my friend, because all you need to do is fly over to Rom and book a table at this marvelous restaurant on the top of Hotel Palazzo Manfredi. 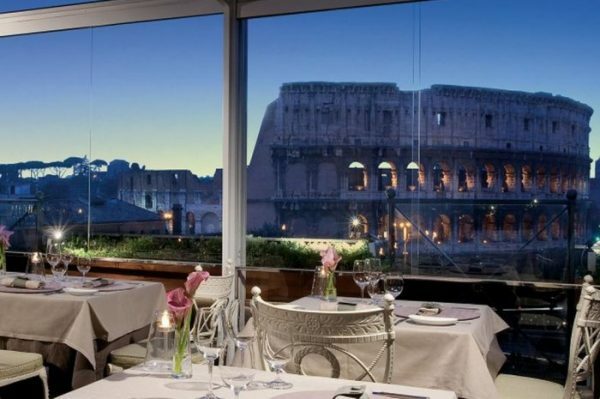 You will have a perfect view of the dimly lit, wonder of the world known as Colosseum. 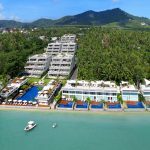 The hotel is economical – the food and environment are worth your 140 euros. During winters, it is enclosed by glass windows and ceiling to keep the diners warm and cozy. During summers, however, the place is open for fresh air. 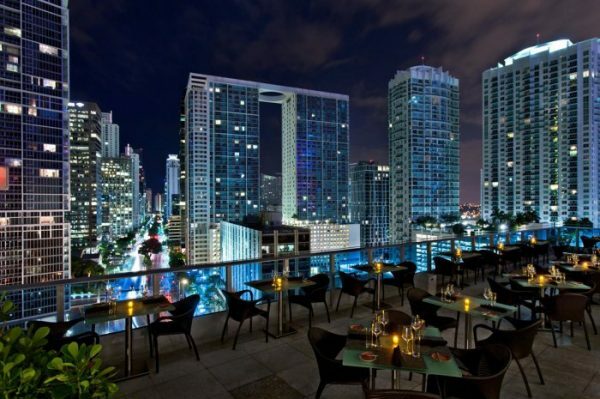 If you are currently in Miami and want to dine at a place where you can feast and keep your eyes on the lovely beach and sea and the city simultaneously? This is where you should be going. The marine-meat based food followed by scrumptious desserts will make you feel over the moon. However, the place can get very busy (obviously), so try to be there early so that you can have a decent place to sit and enjoy. This place has some distinctive features, such as the fact that it has been built in the shape of a crescent. 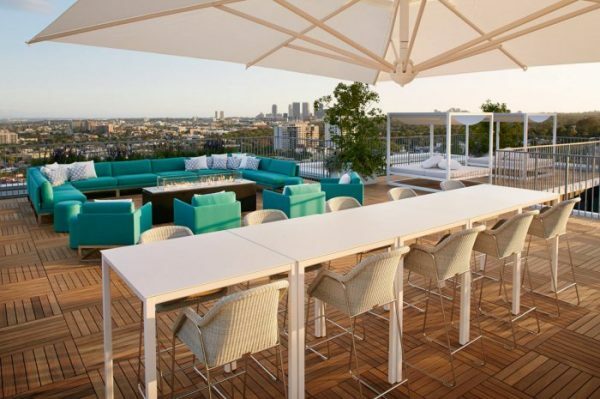 Located on the top of the Unique Hotel, this rooftop bar gives a stunning view of the horizon, the city including the Ibirapuera Park. The menu has everything you can imagine of- Brazilian, French, Italian and Japanese and the beverages have enough variety to even let you taste caipirinha. In the centre, is a rectangular pool filled with red water that adds to the beauty of the restaurant and bar.